Click the subscribe button to go to iTunes. You can subscribe to the Billy Gorilly Show Podcast FREE at the iTunes Music Store to receive new episodes automatically. This makes it easy to download to your ipod or other mp3 player. Windows users you will need to install itunes if you don't already have it on your computer. You can also subscribe to Billy Gorilly's Podcast RSS feed using the RSS reader of your choice. 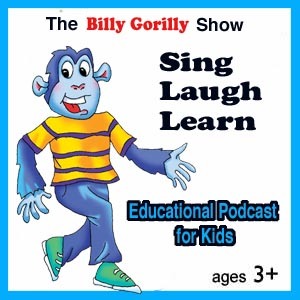 The Billy Gorilly Podcast for Kids is perfect for ages 3 years-up. Billy Gorilly And the Candy Appletree Family sing songs, teach interesting things, and tell stories. Kids can listen and learn from the cartoon characters looking forward to each new episode. Each podcast is 10-15 minutes long. Look for our podcast in the iTunes Music Store. Make each and everyday Simply Splendiferous with Billy Gorilly. free activity pages to go along with this podcast. Billy Gorilly and Mrs. Flicker Fireflybrarian are so excited for the summer reading program. A library in your area is probably having one. You should go and check it out. Billy Gorilly and Mrs. Flicker tell you all about it. Billy even sings his "Make A Splash" song. Don't forget to look below for free Make A Splash printables. Billy Gorilly's good friend Owlton W. Hootley sings his song Hopping Toads and Jumping Frogs. Kids will learn all kinds of frog facts as they listen and sing along. Get the activity pages below. View step-by step aquarium instructions with pictures on Billy Gorilly's blog here. our activity pages. The files are in .pdf format and they are free. Use Adobe Acrobat to print. If you should need the Adobe software it's also free. You most likely have Adobe Acrobat already on your computer. If not click the link below to get.